Spacing between bulbs: 7.5 cm for large bulbs; 2.5 cm for small bulbs. Light requirements: full sun to full shade. Landscape uses: Narcissi are suitable for almost every possible application: fields, beds, containers, borders, rock gardens, as cut flowers, and for forcing. Narcissi join tulips, hyacinths and crocuses to make up the most important of the spring-flowering bulbous, cormous and tuberous plants. Narcissi are used in abundance in gardens. This has much to do with their winter hardiness, the ease with which they naturalise, and their many applications. The various colours and flower types available also play a role in their popularity. The large-flowered yellow daffodils in particular are the flowers that promise that the warm spring air is on the way. The number of wild species varies widely, depending on how one defines 'wild species'. Usually this number is limited to 26 (not counting the subspecies and varieties). In addition to these, many hundreds of cultivars are known. The most important colours are yellow, white, orange-red, orange and salmon. Many cultivars display marked or subtle differences in colour between the corona (trumpet or cup) and the perianth (petals). Europe, particularly Spain and Portugal, is where narcissi are most commonly found growing in the wild. As early as the sixteenth century, people - especially the English and the Dutch - were becoming interested in the narcissus. Even today, these two countries are known the world-over as being the leaders in narcissi cultivation. In addition to their garden uses, narcissi are also very important as a cut flower and even have some degree of importance as a pot plant. Another added attraction is that several species are quite sweetly-scented. Practically all narcissi are winter hardy and can easily tolerate temperatures of -10°C. One exception is the Tazetta narcissi. 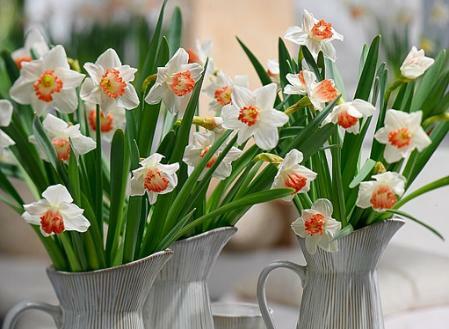 Narcissi can be used for almost any purpose and are even more versatile in the garden than tulips and hyacinths. The only use for which hyacinths and certain groups of tulips surpass narcissi is bedding. The great advantage to using narcissi is that they actually behave as perennial plants in the garden. This, plus the fact that they flower early in the season, means that they are indispensable in the perennial border. Borders that include perennial plants chosen to achieve a summer explosion of colour will especially benefit from the early-flowering bulbous and cormous plants - and the narcissi are definitely the most conspicuous representatives of this group. They can play the solo role when planted among perennial plants that have not emerged or are just starting to do so. Later, the foliage of these perennials will nicely cover the withering foliage of the narcissi. Narcissi can also be combined beautifully with early-flowering perennial plants such as Euphorbia polychroma, Beronia, Primula, Pulmonaria, Pulsatilla, Alchemilla mollis, Brunnera macrophylla and late-flowering species of Helleborus. Another good use for them is under shrubs and trees with diaphanous crowns. Here, we can profit from the fact that narcissi can tolerate a certain amount of shade. Lovely combinations can be realised by planting narcissi with shrubs that flower simultaneously (approximately March-April). There are many to pick from: Spireae x arguta, Amelanchier lamarckii, Daphne mezereum, Corylopsis pauciflora, Magnolia stellata, Rhododendron ‘Praecox’, Mahonia aquifolium, Spiraea thunbergii, Skimmia japonica, and Prunis triloba ‘Plena’. Plenty of arguments also exist for planting narcissi in the neighbourhood of sombre-looking evergreen shrubs and conifers. Here, their bright yellow and white colours will provide a cheery contrast. Narcissi are also useful for planting among ground covers such as Vinca minor, Pachysandra terminalis, Lamiastrum galeobdolon and even Hedera helix. Naturalising is one of the things narcissi do best, so they are perfect for planting among perennial plants, under shrubs and between ground covers. They can also be used this way in the lawn if measures are taken to avoid mowing their foliage before it withers. This will mean that the first mowing of the year will have to wait for six weeks after the narcissi have faded, or that mowing will have to be done between the narcissi plants. For naturalising, certain narcissi are perhaps better than others. Recommended are: varieties from the Cyclamineus Division such as ‘February Gold’, ‘Jack Snipe’, ‘Jenny’, ‘Jumblie’, ‘Peeping Tom’, ‘Little Witch’, ‘Tête à Tête’, and ‘Jetfire’. Other good cultivars are: ‘Carlton’, ‘Actaea’, ‘Dutch Master’, ‘Barrett Browning’, ‘Birma’ and ‘Golden Harvest’. Narcissi are increasingly being used in pots. Some of these are being sold as semi-forced products. At the time of sale, these plants are already in bud and can immediately be placed on the balcony or patio. Naturally, these varieties will be ones that have a small foliage mass and short stems. The highly versatile ‘Tête à Tête’ is one of these, but others include the ‘midi-narcissi’. These midi-narcissi have large flowers on relatively short, sturdy stems. They also come into bud early, meaning that they have highly visible flower stems at the time when leaf development is still just starting. A few worth mentioning are: ‘Beau Geste’, ‘Pistachio’, ‘Camelot’, Gold Medal’, ‘Modern Art’ and ‘Hokus’. In the first place, we should choose varieties that remain short and do not produce a foliage mass that is too large. Containers should be at least 25 centimeters deep, but preferably 30 centimeters deep. Excess water must be able to drain off quickly. This means that a minimal requirement will be drainage holes in the bottom of the pot and also low on the sides. A layer of pot shards (or better yet, clay granules) on the bottom will also prevent the temporary trouble caused by too much water. If possible, place the pot or container on top of a few little ceramic blocks to allow any excess water to drain off faster. When planting, fill the container with potting soil (if desired, mixed with some ordinary but well-worked garden soil) up to 10 cm below the rim. Then press the bulbs rather carefully into the loosened soil. They can be placed so that they almost touch since they are not going to grow any bigger around. Finally, the last layer of soil can be added and lightly tamped. Naturally, these containers are placed outside. In case of persistent dry weather, they should be watered. It is also advisable to put some reeds or straw over the containers. Hard frost is a reason to put maneuverable containers or pots in a frost-free location (but not one which is very warm). Another possibility is to wrap the containers or pots in bubble wrap. These measures are necessary since, unlike bulbs planted in the ground, bulbs planted in pots and containers are exposed to the cold coming in from all directions.